Our newsletter continues to grow right along with the adventures and accomplishments of our students, faculty and staff! Since our last newsletter, WSU has welcomed their 11th President, Dr. Kirk Schulz. We look forward to getting to know President Schulz and introducing him within the Native community. WSU Native American Programs staff at the University of Montana’s Payne Family Native American Center with UM staff. During the summer, Native Programs held our inaugural NAPFUN!, a planning retreat for our staff. Dr. Ken Lokensgard graciously offered the use of his cabin on Cooper Lake outside of Missoula, Montana. On our way to the cabin, we stopped off at University of Montana and met with staff from their Native programs and toured the beautiful Payne Family Native American Center. Along with cooking together and sharing meals, picking huckleberries, kayaking and canoeing, and enjoying the wildlife – specifically a pair of foxes that visited frequently – we buckled down to updating our strategic planning document. Our plan aligns with the WSU Strategic Plan and continues to evolve as we proceed to further align our mission and goals with the WSU Drive to Twenty Five! under the leadership of President Schulz and Provost Dan Bernardo. 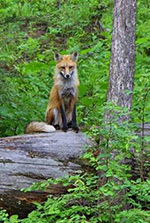 One of Cooper’s Lake’s resident foxes. The semester started out with activities and open house during the Week of Welcome for new students. Sequoia Dance, Shoshone Bannock and one of our first Native Building graduates, completed the final requirements of her degree in Human Development through an internship working with Native Programs. 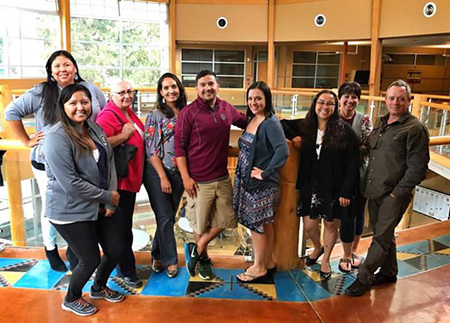 Sequoia planned and coordinated our first Tribal Nation Building Orientation program for this year’s Nation Building cohort, getting them all off to an informed start regarding the program and an introduction to their cohort and faculty and staff. 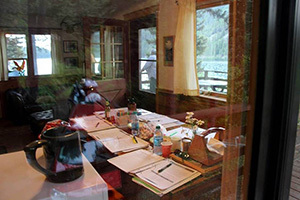 Meeting Room: proof of work – boss outside the door calling everyone back from a break. In our last newsletter, we reported on the pre-ground breaking ceremony led by members of the Nez Perce Tribe for the Elson S. Floyd Cultural Center at the entrance of campus. The building is rising and its iconic architecture will make it a standout on campus! The construction of the building can be viewed in real-time at: https://app.oxblue.com/open/absherconstruction/wsuesfcc. We look forward to a grand opening in 2017 and to hosting many exciting cultural events within this new space. The WSU experience goes far beyond the classroom through opportunities for internships, study abroad, activism, cultural learning, friendship, and leadership. The following articles attest to the many ways that our students are supported and encouraged to expand their horizons and benefit from these opportunities in the present with a long term benefit for their futures and their contributions to Native America! Standing behind them (and sometimes leading the way) are our staff dedicated and committed to our students’ success.